When I was in Florence Italy I remember having a wonderful dish created with Ricotta Cheese Gnocchi and a light Gorgonzola Cream Sauce. The Gnocchi were like little pillows of air, light not heavy like some of the Gnocchi bombs I have had in the past! Here is a recipe for the Gnocchi itself. For the sauce I would add some heavy cream to a saute pan about 1 1/2 cups, sea salt and fresh ground white pepper, a sprig of fresh basil and 1/4 cup crumbled Gorgonzola cheese with a little Parmesan. Toss your Gnocchi in the sauce and add a fleck or two of cold butter and reduce. This is sort of like a modified Alfredo sauce. Results - Gnocchi Competition, originally uploaded by avlxyz. 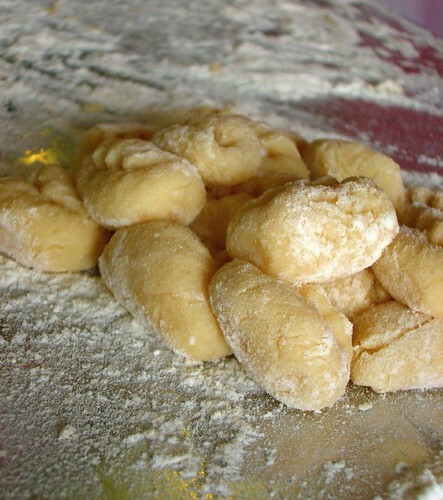 Roll your Ricotta Cheese Gnocchi dough into a rope and cut it into even pieces. For the classic look you may press them out by pulling forward with your thumb and roll them back or use the tines of a fork pressing on top an pulling towards you so they curl up. Some cooks prefer the use of a Gnocchi Board . Drain the boiled Ricotta Cheese Gnocchi then immediately toss them in the Gorgonzola Cream Sauce I mentioned, Italian Gravy, Pesto or favorite pasta sauce and serve.